This summer, in my quest of saving money on our monthly gas bill (ouch), I wanted to purchase an attachment for my bike that my daughter could enjoy riding around on. Being six years old and having special needs I needed something pretty unique. She has long out grown the enclosed trailer attachment. She wants to be able to experience the ride along with the rest of the family when we are on our bike outings. She’s a big girl and needs to be treated as such. What did I discover that would accomplish all of the above? The amazing Weehoo. In truth, a friend of mine, who has a son with Down syndrome also, introduced this great product to me a few months back. She had found it at REI and thought it would be perfect for our kiddos; though rather pricey. She had waited until the second model was released and then purchased the first model at a lower price. Seeing her and her son on it the first time was awesome, unlike anything out there. It is not just another seat attachment for the rider to just sit there, it is like adding an additional bike to the back of your own. Well equipped with a sturdy seat and three point safety harness. There are pedals for the rider that Velcro their feet securely in; avoiding any dangling feet that could cause an injury or accident. As a bonus, when the rider pedals forward it will actually assist in propelling the bike forward. I know right? How awesome is that. I really look forward to the day when my little Lulu learns how to do this. What’s even more, two side pouches for carrying needed items on the go. Living in a small Colorado town and not wanting to drive to the “big city” to make my purchase I stopped by our local bike shop – Spokes – and asked if they could order me in one. I assured the owner that if they got the Weehoo in, I would not be the only one buying one. Sure enough just before the onset of summer vacation my Weehoo arrived in stock at Spokes. Mine, by the way, was the third purchase of the Weehoo for Spokes by the time I got in to pick ours up, yep told yah. Over all I am thrilled with this product! It has not only helped our gas budget, but the kids and I get to be out everyday getting some great exercise biking around town to various summer activities. For anyone who has a child with Down syndrome, and enjoys biking, I think the Weehoo is a must for the summer. We will be using it (weather permitting) to get to and from school in the fall as well. 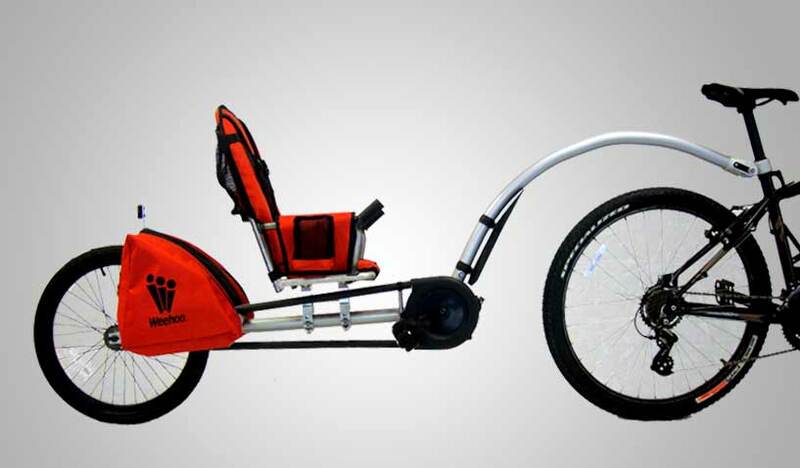 It is impressive for any rider, up to 75 pounds, special needs or not. It is not a product that is specifically marketed for those with special needs, but it certainly appeals to those of us with this need in their family. Anyone with a child ages 2-9, between 38″-52″ tall, would enjoy the Weehoo. For my daughter she may well be able to ride it into adulthood. Thank you Weehoo for such a great outdoor product that is family friendly and realistic for our needs.